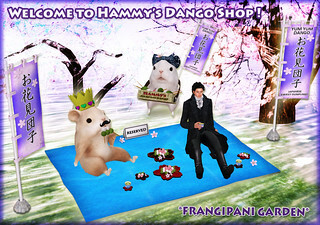 Hammy's Ohanami Dango Shop has been opened! Welcome to Hammy's Ohanami Dango Shop! Ohanami is a Japanese style cherry-blossom viewing picnic party. We will treat our guests with good sweets @ .Whimsical. *All items are 1 prim / 1 land impact each. *For both Human & Hamster avatars! From Feb. 18th – Mar. 3rd, 2016. Our store is No.66 on the map.